A digital camera or digicam is a camera that captures photographs in digital memory. Most cameras produced today are digital, and while there are still dedicated digital cameras, many more cameras are now being incorporated into mobile devices, portable touchscreen computers, which can, among many other purposes, use their cameras to initiate live videotelephony and directly edit and upload imagery to others. However, high-end, high-definition dedicated cameras are still commonly used by professionals. Steven Sasson, an engineer at Eastman Kodak, invented and built the first self-contained electronic camera that used a charge-coupled device image sensor in 1975. Early uses were mainly military and scientific; followed by medical and news applications. Compacts often have macro capability and zoom lenses, but the zoom range (up to 30x) is generally enough for candid photography but less than is available on bridge cameras (more than 60x), or the interchangeable lenses of DSLR cameras available at a much higher cost. Autofocus systems in compact digital cameras generally are based on a contrast-detection methodology using the image data from the live preview feed of the main imager. Some compact digital cameras use a hybrid autofocus system similar to what is commonly available on DSLRs. A variety of additional features are available depending on the model of the camera. Such features include GPS, compass, barometers and altimeters. The rising popularity of action cameras is in line with many people desiring to share photos or videos in social media. Many competitive manufacturers of action cameras results in many options and lowered, competitive prices, and nowadays, cameras are sold bundled with waterproof housings, accessories, and mountings compatible with the popular GoPro. In late 2008, a new type of camera emerged, called a mirrorless interchangeable-lens camera. 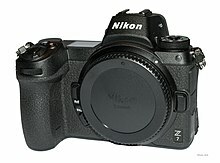 It is technically a DSLR camera that doesn’t require a reflex mirror, a key component of the former. While a typical DSLR has a mirror that reflects light from the lens up to the optical viewfinder, in a mirrorless camera, there is no optical viewfinder. The image sensor is exposed to light at all times, gives the user a digital preview of the image either on the built-in rear LCD screen or an electronic viewfinder (EVF). These are simpler and more compact than DSLRs due to not having a lens reflex system. MILCs, or mirrorless cameras for short, come with various sensor sizes depending on the brand and manufacturer, these include: a small 1/2.3 inch sensor, as is commonly used in bridge cameras such as the original Pentax Q (more recent Pentax Q versions have a slightly larger 1/1.7 inch sensor); a 1-inch sensor; a Micro Four Thirds sensor; an APS-C sensor found in Sony NEX series and α "DSLR-likes", Fujifilm X series, Pentax K-01, and Canon EOS M; and some, such as the Sony α7, use a full frame (35 mm) sensor, with the Hasselblad X1D being the first medium format mirrorless camera. Some MILCs have a separate electronic viewfinder to compensate the lack of an optical one. In other cameras, the back display is used as the primary viewfinder in the same way as in compact cameras. One disadvantage of mirrorless cameras compared to a typical DSLR is its battery life due to the energy consumption of the electronic viewfinder, but this can be mitigated by a setting inside the camera in some models. Olympus and Panasonic released many Micro Four Thirds cameras with interchangeable lenses that are fully compatible with each other without any adapter, while others have proprietary mounts. In 2014, Kodak released its first Micro Four Third system camera. As of March 2014[update], mirrorless cameras are fast becoming appealing to both amateurs and professionals alike due to their simplicity, compatibility with some DSLR lenses, and features that match most DLSRs today. Sony Cyber-shot QX series "Smart Lens" camera, announced and released in mid 2013 with the Cyber-shot DSC-QX10. In January 2014, a firmware update was announced for the DSC-QX10 and DSC-QX100. In September 2014, Sony announced the Cyber-shot DSC-QX30 as well as the Alpha ILCE-QX1, the former an ultrazoom with a built-in 30x optical zoom lens, the latter opting for an interchangeable Sony E-mount instead of a built-in lens. Kodak PixPro smart lens camera series, announced in 2014. These include: the 5X optical zoom SL5, 10X optical zoom SL10, and the 25X optical zoom SL25; all featuring 16 MP sensors and 1080p video recording, except for the SL5 which caps at 720p. ViviCam IU680 smart lens camera from Sakar-owned brand, Vivitar, announced in 2014. Olympus Air A01 lens camera, announced in 2014 and released in 2015, the lens camera is an open platform with an Android operating system and can detach into 2 parts (sensor module and lens), just like the Sony QX1, and all compatible Micro Four Thirds lenses can then be attached to the built-in lens mount of the camera's sensor module. Until early 2014, only Sony had released DSLT cameras. By March 2013, Sony had released more DSLTs than DSLRs with a relatively complete lenses line-up. Stand alone cameras can be used as remote camera. One kind weighs 2.31 ounces (65.5 g), with a periscope shape, IPx7 water-resistance and dust-resistance rating and can be enhanced to IPx8 by using a cap. They have no viewfinder or LCD. Lens is a 146 degree wide angle or standard lens, with fixed focus. It can have a microphone and speaker, And it can take photos and video. As a remote camera, a phone app using Android or iOS is needed to send live video, change settings, take photos, or use time lapse. Sales of traditional digital cameras have declined due to the increasing use of smartphones for casual photography, which also enable easier manipulation and sharing of photos through the use of apps and web-based services. "Bridge cameras", in contrast, have held their ground with functionality that most smartphone cameras lack, such as optical zoom and other advanced features. DSLRs have also lost ground to Mirrorless interchangeable-lens camera (MILC)s offering the same sensor size in a smaller camera. A few expensive ones use a full-frame sensor as DSLR professional cameras. In response to the convenience and flexibility of smartphone cameras, some manufacturers produced "smart" digital cameras that combine features of traditional cameras with those of a smartphone. In 2012, Nikon and Samsung released the Coolpix S800c and Galaxy Camera, the first two digital cameras to run the Android operating system. Since this software platform is used in many smartphones, they can integrate with services (such as e-mail attachments, social networks and photo sharing sites) as smartphones do, and use other Android-compatible software as well. In an inversion, some phone makers have introduced smartphones with cameras designed to resemble traditional digital cameras. Nokia released the 808 PureView and Lumia 1020 in 2012 and 2013; the two devices respectively run the Symbian and Windows Phone operating systems, and both include a 41-megapixel camera (along with a camera grip attachment for the latter). Similarly, Samsung introduced the Galaxy S4 Zoom, having a 16-megapixel camera and 10x optical zoom, combining traits from the Galaxy S4 Mini with the Galaxy Camera. Panasonic Lumix DMC-CM1 is an Android KitKat 4.4 smartphone with 20MP, 1" sensor, the largest sensor for a smartphone ever, with Leica fixed lens equivalent of 28mm at F2.8, can take RAW image and 4K video, has 21mm thickness. Furthermore, in 2018 Huawei P20 Pro is an android Oreo 8.1 has triple Leica lenses in the back of the smartphone with 40MP 1/1.7" RGB sensor as first lens, 20MP 1/2.7" monochrome sensor as second lens and 8MP 1/4" RGB sensor with 3x optical zoom as third lens. Combination of first lens and second lens will produce bokeh image with larger high dynamic range, whereas combination of mega pixel first lens and optical zoom will produce maximum 5x digital zoom without loss of quality by reducing the image size to 8MP. Since it is much easier to manufacture a high-quality linear CCD array with only thousands of pixels than a CCD matrix with millions, very high resolution linear CCD camera backs were available much earlier than their CCD matrix counterparts. For example, you could buy an (albeit expensive) camera back with over 7,000 pixel horizontal resolution in the mid-1990s. However, as of 2004[update], it is still difficult to buy a comparable CCD matrix camera of the same resolution. Rotating line cameras, with about 10,000 color pixels in its sensor line, are able, as of 2005[update], to capture about 120,000 lines during one full 360 degree rotation, thereby creating a single digital image of 1,200 Megapixels. ^ Dobbin, Ben. (September 8, 2005) "Kodak engineer had revolutionary idea: the first digital camera." Seattle Post-Intelligencer. Retrieved on 2018-02-06.